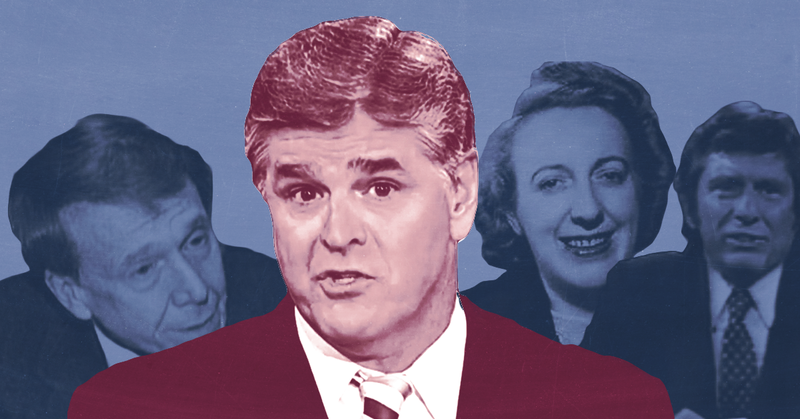 Radio was Hannity’s tutor: From morning till night, he’d tune into local right-wing talkers like Bob Grant and Barry Farber, progenitors of the hyperpoliticized style that Rush Limbaugh would perfect. “Yes, go ahead,” Grant replied. After the address was read, Grant boasted that his touting of Taylor’s book, Paved With Good Intentions, had boosted sales. BOB GRANT (HOST): But right now it’s Diane, who is our first caller. CALLER: Yes, oh, OK. I’m calling, I just turned on the radio, and I must say I'm kind of outraged here, Bob, to hear you referring to American blacks as “savages.” How dare you? GRANT: I dare very easily because if they act like savages, I call them savages. Liberty Lobby opposed “so-called ‘civil rights’ laws” and supported a 1952 immigration law vetoed for its "absurdity" and "cruelty" but cited in Trump's Muslim ban. According to an FBI photocopy of a Liberty Lobby promotional pamphlet, the organization's policy positions included opposition to “so-called ‘civil rights’ laws,” “world government,” and “federal aid to Education,” while supporting “states’ rights,” withdrawal from the United Nations, a “pro-American foreign policy,” and the “Realignment of Parties.” Liberty Lobby’s list of political positions also included supporting the “McCarran-Walter Immigration Act,” officially named the “Immigration and Nationality Act of 1952.” The law was vetoed by President Harry Truman for its “absurdity” and the “cruelty” it inflicted on immigrants, but Congress overrode his veto. The law, which was extensively modified in 1965 and remains partially in effect, was prominently cited in Trump’s first and second iterations of the Muslim ban.